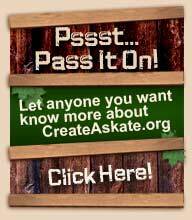 CreateAskate.org would like to thank the following for all their time, resources, energy and thought-leadership in the developmental phase of this one-of-a kind program. Having the experience of strategic vision and the unique ability to be immersed within youth culture, S2F provides knowledge and skills that identify with all of the stake-holders of this project whether it be Student/Parent/Educator/Administrator. By directing and managing all areas of activity for the project, S2F is able to identify problems and work with all individuals connected with the CreateAskate.org program in order to formulate viable solutions in both analytical and creative areas. For participating in the pilot program that validated that a student interested in learning is a student most likely to succeed in school, something most of us have known for a long time. ED offered a multidisciplinary range of Website strategies, design, and business applications that enabled us to enhance the CreateAskate.org experience on multiple levels through education, perception, and interaction. We now have a valuable and powerful tool that we can use to convey any message both visually as well as in content. Provided award winning documentary video/audio/editing pieces as well as creative content. Contributions were made by the E2B Master's candidates of Pepperdine University who helped formulate the ideas of growth and success for the CreateAskate.org program. Each student made significant individual strides in identifying and resolving complex issues associated with such a dynamic project throughout the 4 month immersion. They were led by some of the finest instruction we could have hoped for.